Written by Ariana Gunderson. All Photographs by Alexander Rogala. The doorbell rings, announcing the first guest’s arrival. One by one, the five guests climb the steps, take off their coats, and meet a small group of strangers. One person lays out a casserole dish, one 6 cans of soda on the side table. A few pots are warmed on the stove. Once all the dishes are ready, we grab our plates, take a bit of everything, and sit down to start our Nostalgia Dinner. Nostalgia Dinners, participatory research events studying food memory, began as part of my Introduction to Gastronomy: Theory and Methodology course, taught by Dr. Megan Elias. 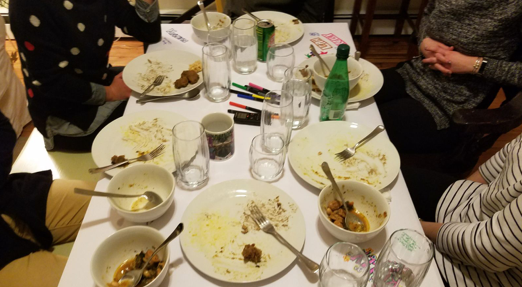 The Nostalgia Dinner Series has now grown into a collaborative research project, in which every guest shares their lived experience as data and becomes a co-investigator. 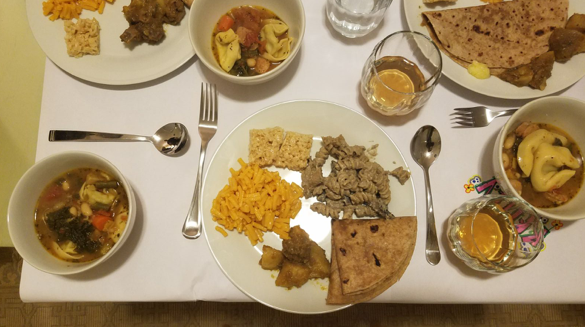 A Nostalgia Dinner takes place on one night in one apartment living room, but the food and conversation traverse time and place, spanning continents and decades. At these dinners, each guest brings a dish that evokes ‘nostalgia’ for them, sharing tastes and taste memories with the group. As we eat, we hear the stories behind the food and learn why each guest chose their dish for the dinner. We draw connections between the dishes and memories brought to this event, wrestle with concepts and definitions of nostalgia, and peel back the emotional layers of food memory. Because every Nostalgia Dinner has a different menu and guest list, the discussion is never the same twice. 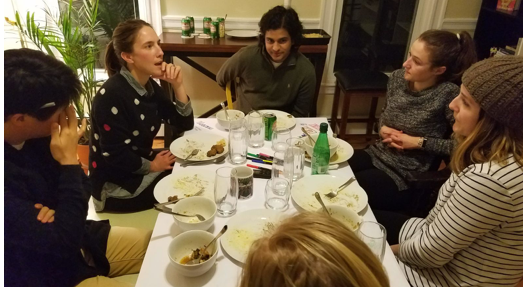 At one February 2018 nostalgia dinner, lamb curry led to a discussion on coming to terms with the exploitation of gendered foodwork in one’s own family history, and ‘Mom’s Soup’ sparked talk on the renegotiation of family dinner when one moves back home in one’s twenties. Rice Krispies revealed the taste of a specific place (Boston Logan Airport, upon returning from a long journey) and Guaraná soda the taste of specific time in the past (early childhood spent in Brazil). A now-vegan guest’s mushroom version of her father’s beef stroganoff brought into stark relief the inaccessibility of the past. Her taste memories connect her to those dinners of middle school weekdays, but her age, changing diet, and life in a new city make clear how impossible it is to truly recreate a meal of the past. The next Nostalgia Dinner will cover different intellectual territory, shaped by its unique configuration of dishes and participants. In studying food and memory, I try to choose methodologies that honor the knowledge and lived experience carried within each person. I believe this topic, tangibly relevant to everyone who has ever eaten (or not eaten) and remembered it, can be best explored collectively. In my Nostalgia Dinner Series, I learn from my guests about their experience with and memories of food, just as I hope this experience will encourage them to think about food and memory in new ways. If you are interested in attending a Nostalgia Dinner this spring, please email Ariana at arianag@bu.edu.